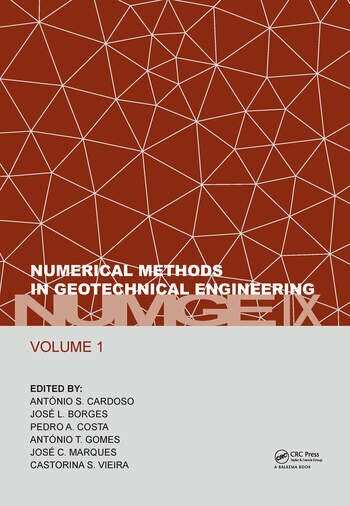 NUMGE 2018 is the ninth in a series of conferences on Numerical Methods in Geotechnical Engineering organized by the ERTC7 under the auspices of the International Society for Soil Mechanics and Geotechnical Engineering (ISSMGE). The first conference was held in 1986 in Stuttgart, Germany and the series continued every four years (1990 Santander, Spain; 1994 Manchester, United Kingdom; 1998 Udine, Italy; 2002 Paris, France; 2006 Graz, Austria; 2010 Trondheim, Norway; 2014 Delft, The Netherlands). The conference provides a forum for exchange of ideas and discussion on topics related to numerical modelling in geotechnical engineering. Both senior and young researchers, as well as scientists and engineers from Europe and overseas, are invited to attend this conference to share and exchange their knowledge and experiences. This work is the first volume of NUMGE 2018.